This 100 Person Metal First Aid Cabinet meets or exceeds all OSHA and ANSI requirements for workplace safety. This first aid kit, neatly put together in a metal cabinet, is recommended for construction sites, industrial zones, factories and offices. 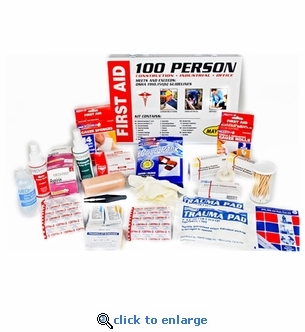 Dimensions: - 10 3/4" x 10 3/4" x 2 5/8"
100 Adhesive Bandage 1" x 3"
100 Adhesive Bandages 3/4 x 3"
1 Burn Spray - 3 oz. 1 Antiseptic Spray - 3 oz.